Mt. Manaslu that lies at the elevation of 8156m and world’s eighth highest mountains in the world stays majestically away from the crowds.Similar in many respects to the Annapurna tour, the Manaslu trek takes place in a valley of lesser frequentation. The recent construction of lodges sees this circuit evolve over the years. The gompa (monastery) of Sama, in an amphitheater at the foot of the Manaslu, marks the entrance into Buddhist territory.The Larkya Pass (5135m), the high point of the route, presents a gentle slope before plunging abruptly to reach the lower valleys. Superb panoramas, typical villages inhabited by different ethnic groups. The diversity of the landscapes of the Manaslu, massive little frequented. An optimal acclimatization with the ascent to the base camp of Manaslu in the heart of superb panoramas. The program will be: the Patan and Bhaktapur Durbar Square monuments with their wooden pagoda-temples, the Boudanath or Swayambhunath’s buddhist sanctuaries and Pashupatinath hinduist one where the cremations occur, not to speak of the many temples spread about along the crowded and busy streets of the antique city. Leaving by bus early in the morning to Gorkha, a 5h ride for 140km. Lunch in a small local restaurant at Mugling Bazar. At Gorkha, all the local staff is waiting for us. Some time is needed for the loads sharing and we can start. A great adventure begins. A series of stone staircase for reaching the old royal palace we will visit on the way. Camp a little bit down in very nice rice fields facing Manaslu and Annapurna range. Today a day across ricefields and other crops fields as millet, mustard, all terrace fields carved into the hills. Gorgeous views because out trail is often on the ridges. After crossing a short pass, we go down the thalweg and cross a small river many times. Past rice and millet fields, hamlets scattered all along the valley. After a suspension bridge at the Buri Gandaki confluence point, we reach Arughat. Checkpost and have a short rest. Camp a little bit upstream near Kati Bazar alongside the Buri Gandaki river. Now during 8 days we are going upstream the Buri Gandaki, till its spring. On the right bank, the trail crosses a very cultivated region, then drops to the riverbed (useable only in the dry season). We cross many tributaries till the confluence with the Soti Khola and 55mn away, in the most convenient spot, we have our camp. Today the landscape definitely changes. We cross forest covered hillsides before the banks change into vertiginous cliffs. The gravelled trail goes up and down... A little bit up, at Lapbesi, the valley widens again and we walk along the bottom, a large white sandy bed. Camp at the Maccha Khola confluence. The cultivated area ends because the slopes become too steep and the rare remainded fields are poor. We walk upstream the river caught between two cliffs till Tatopani hot springs. We go to the other bank by crossing a suspension bridge, and we walk through a woody area. Farther the river is getting turbulent, forcing its way through the rocks. Camp in a valley widening place between very high cliffs. Past Jugat in the morning, a small village interesting by the style of its houses which is caracteristic of high valleys entrance. In front of us a modest 7000m high mountain: “The Shringi Himal”. The valley is extremely deepsided. The landscape is getting clearly alpine and wonderful, with nice pine forests. We walk on a balcony path cut through the cliff above a drop. Views of ganesh and Chuli mountains. Camp 300m down on a flat spot limited by mani walls. The river is flowing in the bottom of a deep and narrow gorge, a nice canyon we follow on a cliff trail. It definitely starts to go up through an extraordinary forest mingling the features of different kinds of vegetation and with many monkeys. We are now in buddhist area with a lot of nice mani walls. Camp just near Namru village, at the foot of a high waterfall. Past Ligaon, Sho, Lo..., all very nice Tibetan villages with many people in the fields: it’s magnificent. The Manaslu with its different satellites appears above larch forests and temples. Camp a little far away Sama, the valley center ,at the foot of the Manaslu north face. An extraordinary day of beauty,one we will never forget. Hike around for acclimatisation and taking pictures. The Manaslu east face, still unclimbed, is towering us more than 4000m, with beside it the Ngadi, Peak 29... amazing! 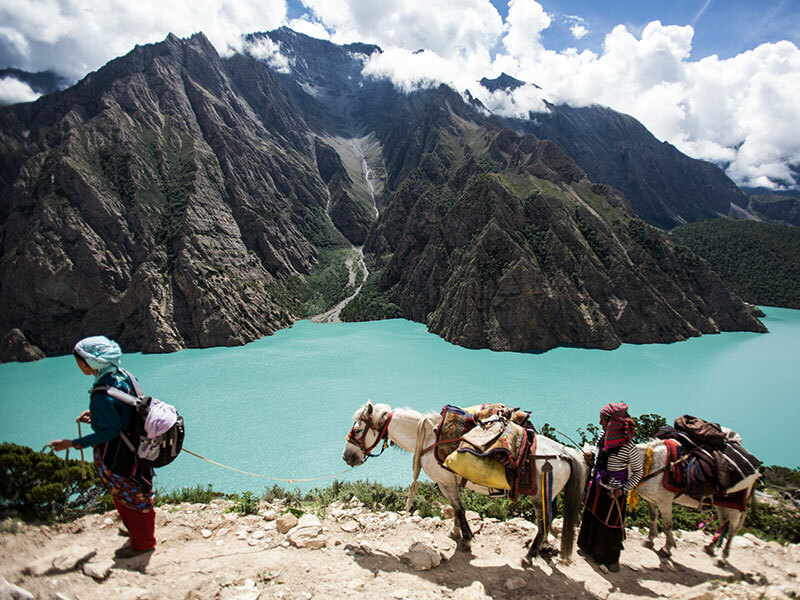 We still steadily go up through high altitude yak pastures. On the left, black glaciers and austere rock faces. Camp near a brook. Larkya B. C. - Larkya Pass (5135m) - Bimdakhati (3800m) – 8 Hrs Trek. The ascent continues on the east hillside of the pass, gently, then clearly too gently, giving us the impression of not going ahead, with the very nice Larkya Peak as a focal point. From there and all along the way down of a huge moraine,an eerie panorama of the Peri Himal cirque. During a few hours we don’t know where to look: the Peri Himal massif, the huge west side Manaslu cirque... amazing! A fairy atmosphere through the forest: rhododendrons, very big trees, branches covered with lichens, glaciers on the background and the Dhudh Khola, an impetuous torrent, we are walking along. Camp in the playground of the Tilje school. 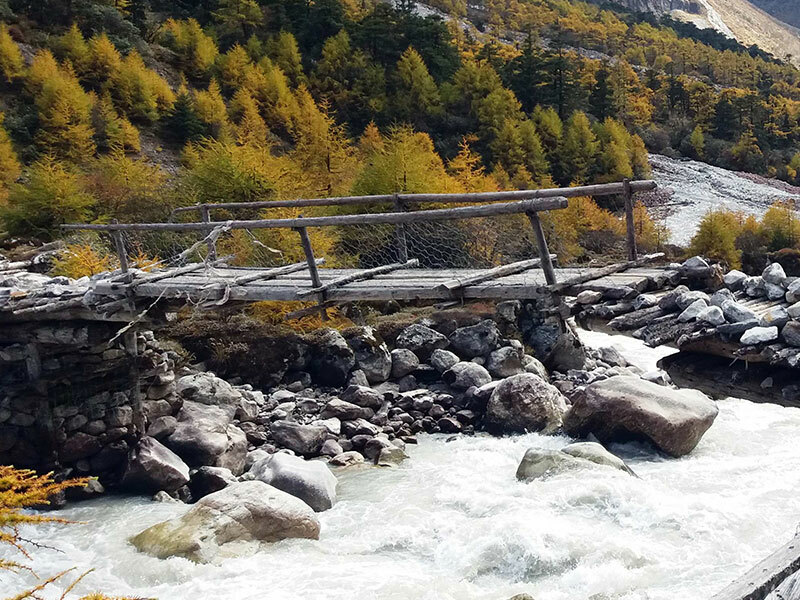 Walking down along the Dhudh Khola till Thonje, where is the confluence point with the Marsyandi river, and we rejoin the Annapurna round trail. Camp 2h far away downwards Tal village, near Chamje. The trail goes across terrace rice fields, then up to Bahudanda, a Gurung village on a hill, then drops to the confluence point of the Ngadi river and the Marsyandi torrent. A nice campsite near the bridge over the Ngadi. The Marshyandi valley opens and on its banks terrace fields and villages clung very high to the hillsides are the age-old work of the Nepaleese farmers. We cross several interesting villages as Bhulbhule, Khudi. Then we walk on a flat part alongside the left bank of the Marsyandi. A last walk up for reaching Besi Sahar, a dusty and busy place which marks the end of our trek and the beginning of the civilisation. Last camp around. We put everything any-old- how on a truck. Better to squeeze together for standing by each other along the 3 to 4h bumpy road to Dumre where we get a bus to Kathmandu. After a 5h ride we are happy to go in a comfortable hotel after a so hard day. Depending on your flight time, our airport check in is 3 hours prior to the departure time and the hotel checkout time is 12PM. In case our flight is late evening please let us know if you require half day use of the hotel. Our representative will meet you at the hotel and transfer you to the airport. 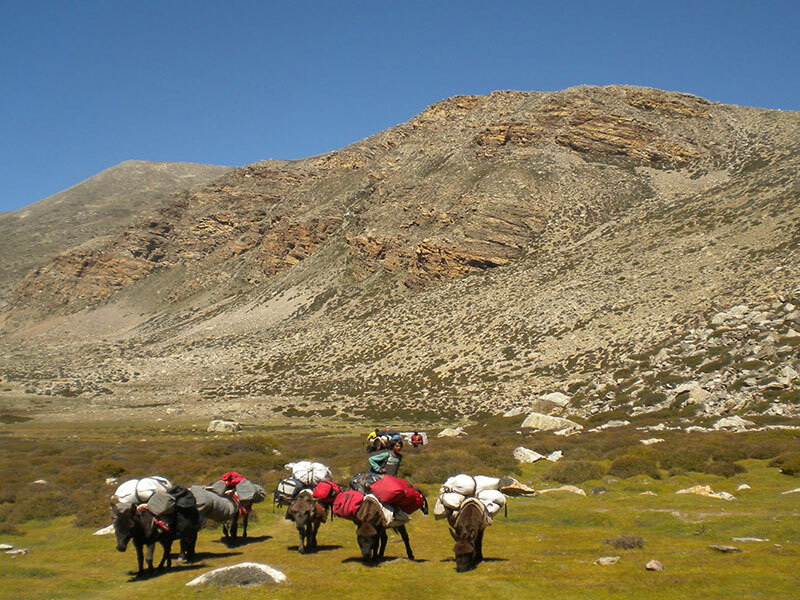 This tour spends 3 nights in a hotel in Kathmandu, and 18 nights on the trek in tents on sharing basis. On the trek, we will stay in two men tents with our kitchen staff preparing the meals including breakfast, lunch, and dinner. During long days walks, we might have to prepare packed lunch in the morning and carry with us. Day 16 : Larkya B. C. - Larkya Pass (5135m) - Bimdakhati (3800m) – 8 Hrs Trek.